Phosphorescent. Photo by Michael Brooks. Last Wednesday, the day before the highly anticipated Bonaroo, Phosphorescent along with Courtney Barnett took the stage at Exit/In. This night was full of constantly surprising talent and psychedelic jam sessions with more layers than your grandmother’s baklava. The Australian singer/songwriter Courtney Barnett, that we have been highly anticipating, had a bag full of tricks on Wednesday that included capturing our attention from the moment she hit the stage. This incredible performance was only the beginning. Through a wash of choral like arrangements was the eye opening, inventive and intuitive display of Phosphorescent, truly an experience that was one of a kind. Keep reading here to get the full story on this incredible lineup, and be sure to check out the gallery of photos from Michael Brooks Photography. Courtney Barnett, the Australian singer/songwriter with a fiery tenacity for rambling off witty lyrics over an enclave of fuzz rock, provided one hell of a performance last Wednesday at Exit/In opening up for Phosphorescent. We’ve been pretty excited about this show for a while now, and it was more than even expected, due in large part to Barnett. Early on as the room became more and more full onto the stage, she arrived. With only a look and a, “we good?” they dropped into their slow building explosion of melancholy surf rock. What a display of ferocity, there was a deep underlying passion to the way that Barnett performed. Almost as if in a trance lost in the ebb and flow of electric fusion Barnett and band seamlessly drifted from dreamlike (“Out of the Woodwork”) into fiery adrenaline chasing (“History Eraser”) and around to the fan favorite catchy ramblings of “Avant Gardner”. All of which you can now get on Courtney Barnett’s recently released The Double EP: A Sea of Split Peas. Undoubtedly, an incredible joy of the night was the high energy melting pot musings of the Melbourne based Courtney Barnett. If you’re thirsting for more of these antics then take a look at this video for Barnett’s “History Eraser”. After some meandering around amidst a stuffy intermission, a quiet bright tone began to hum from the speakers. Growing slowly into an enveloping hymnal and breathing out like liturgy, Matthew Houck, aka Phosphorescent, met his microphone with a deep intuitive purpose. Like the flawless stroke of a brush, these artists’ created a canvas of woven picturesque lyrics across a landscape of Mexican palms and layered melodies. As the hands began to raise and clap, the familiar tone and Houck’s vocal play rang out in “Song for Zula”. This song, with its deep riding blues riffs and sharp guitar, picks up the pace and breaks the sweat preparing the mind and body for so much more to come. 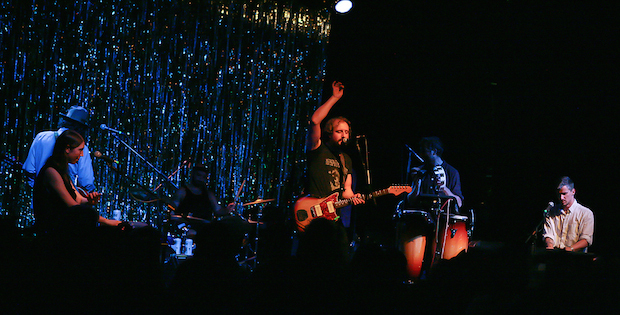 The entire performance by Phosphorescent was littered and riddled with sessions of living organic instrumentation. From spirit awakening organ solos to the psycadelic dimension diving layers of “The Quotidian Beast”, there was a constant grab for your attention, well deserved in the least. Of course, a great performance by great artists cannot be so without the self-contemplative moments found wrapped in the slow uplifting warmth of brass and keys in “Muchacho’s Tune”. The stage banter was close to none and actually unnecessary, moving from the heart thumping thrill of “Ride On / Right On” to the inventive and dynamic performance of “Terror in the Canyons”, was all that was required. Here is a little taste of their creative dispositions in this video for their single “Song for Zula”. Amidst a sea of anticipated Bonaroo madness, these guys did not disappoint, in fact, in the face of it all, they flourished. They didn’t even blink an eye at the packed crowd in Exit/In on that Wednesday. As seasoned pros, Phosphorescent coolly strolled in and out on the shouts of warm hearts singing praise. Courtney Barnett. Photo by Michael Brooks.